I first met Charlie in 2003. I was living in Brent, and my local SWP branch was still working out what we made of our allies in the local Socialist Alliance. To our mind, we had one decisive advantage over them. We liked to think of ourselves as the coalition’s left, the “revolutionaries” where our allies were “reformists”. We had a clear analysis, a shared politics, and a confidence that history would vindicate us. But many of the people we were working with had long histories on the left. Charlie had been in the WRP and was sacked by its despot Gerry Healy, and had written for the opposition’s subsequent newspaper Worker’s Press. He joined in our discussions with a scepticism about any sorts of vanguards and a confidence – no weaker than ours – that history would endorse him. He had a second advantage over us. There was a bye-election taking place in Brent East, one of the first the Alliance had contested, and Charlie, along with several others of the Alliance’s “independents” (most of whom had been members of the Labour Party, or had canvassed for Ken Livingstone in the same constituency) had rather more experience of electoral work than we did. We needed him, it became clear, rather more than he needed us. It was Charlie who asked me to sign a petition, that autumn, to the Socialist Alliance’s national leadership, complaining that the Alliance was seemingly being sidelined within the Stop the War coalition. My reward was a one-hour grilling by one of the leaders of the SWP, outraged by my lack of loyalty in criticising what was in reality a first move to dump the Alliance in favour of what became Respect. Having shouted at me a few times, she clearly felt the meeting had not gone on long enough, so attempted a new attack, suggesting that Charlie and others who had signed the letter (many of whom were members of the Jewish Socialist Group) were not genuine in their support of the Alliance and would defect at the first opportunity. Their cultural Jewishness was not irrelevant to the difficulties she had with them as a generation: she complained about another signatory having been at a meeting where he had spoken a few words of Yiddish in passing. I tried to return the conversation to some kind of rational keel. I’d worked with Charlie (and Alf Filer and others), they were my comrades and I insisted on defending them. Even putting to one side the cultural politics, there was something unpleasant about an individual who has worked for the left for forty years and who has earned from her positions a house, a job, no small amount of publicity – suggesting that Charlie was not in for the long haul, when he was the one who gave his life to unglamorous campaigns, did not put himself forwards, and never took but only gave. There was always a degree of mystery about Charlie, this much older comrade, with eyebrows like an eagle. Who would talk about the left in the 1980s if you asked but preferred your stories. Who always came to meetings alone, and who seemed to have no friends save for comrades in the movement. 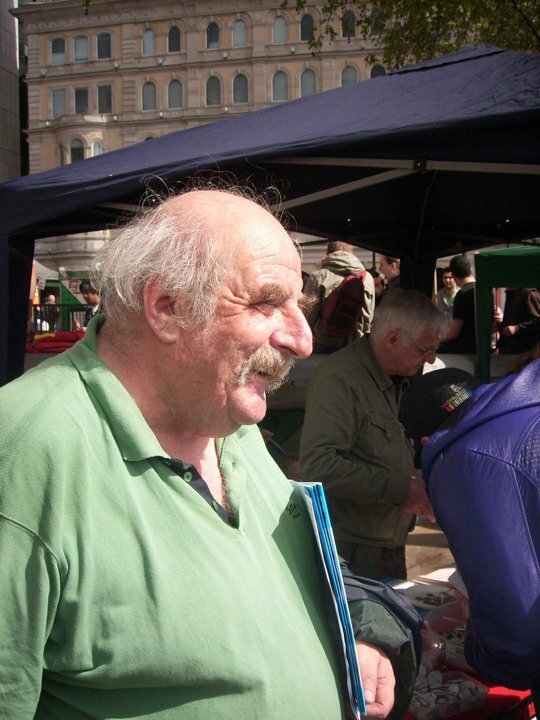 I would return to Brent every couple of years to speak to the trades council and Charlie was always there, always generous, ever encouraging. In 2012, I was representing a blacklisted agency worker in the Employment Tribunal and I think it was Charlie who organised a special message of solidarity from Brent trades council which I received on my phone the evening before the hearing began. I’ve never had a message like that, from the movement, before a case had even started. It gave me enormous confidence (while also adding to the pressure, just a little…) and I showed it to my client the next morning before we went in. I was then cross-examining various managers from the company, some doing their best to be truthful, while others were exuberantly untruthful. Charlie was sitting in the public gallery, watching, enjoying it when I landed one or two blows. The thing about Charlie was that he really didn’t care what group or campaign anyone on the left was in. What mattered was whether they were doing good work. If he believed in you, he would say so, treating you with the same comradely belief as you would expect among members of a revolutionary party that was true to its name. And so, a year later, when the SWP crisis finally blew Charlie was one of my best allies on the outside. Because he had seen me in court and thought I had done ok. And therefore if I ever said “as a lawyer” (let alone as a socialist, or as a human being) “that was no way to run a dispute”, he would agree. He never could understand why that expertise hadn’t been wanted in my party. Having known “only” the WRP, he couldn’t understand that there could be other groups that had even deeper reserves of cynicism than Healy’s. I knew exactly why my comrades didn’t want to get the process right, and focussed on simply getting rid of the issue. Knowing them worse, Charlie couldn’t believe as poorly of them as I did. If I had to think of a single attribute that summed Charlie up I’d choose this: he believed in people. For his belief in me, I’ll always be grateful to him. The Socialist Alliance story is telling. In a way your apparatchik was right – the JSG (and many others) genuinely weren’t loyal supporters of the Alliance project as the SWP conceived it: nobody was, except for the SWP and its allies. Whether a different Socialist Alliance could have been built on more of a consensus basis – well, the history of left unity initiatives isn’t encouraging. But it would have been worth a try. I never met Charlie, I’m sorry to say. I knew him very slightly, through Casablanca and then via his blog; I hadn’t even worked out that he was from an older generation. He was incontrovertibly one of the good guys, and it’s very sad to find his voice has been silenced. Isn’t a sad thing how many fine socialists have been diminished by the organisations which preported to organise them. Increasingly obvious as one reads obituaries of that last great generation that flooded into socialist politics. And how much we’ve all lost as a consequence. A good tribute to a fine comrade. But I am a little puzzled by the phrase “he couldn’t understand that there could be other groups that had even deeper reserves of cynicism than Healy’s.” The implication seems to be that in some ways the SWP was WORSE than the SLL/WRP. I don’t think this fits the facts. As you and I discovered to our great distress, there were some very unpleasant aspects to the SWP which only became fully visible during the Delta crisis. But I, unlike you, observed the SLL/WRP from the 60s to the 80s. The IS/SWP was never remotely as sectarian, as corrupt, as intellectually closed and stultifying as the SLL/WRP. Despite everything, the IS/SWP had some very positive merits (which is why I – and you – stayed so long). Although the SLL began well, it would be hard to find any significant merits after about 1962. A proper understanding of our past is important for building our future. Fair enough Dave, this clarifies the point.